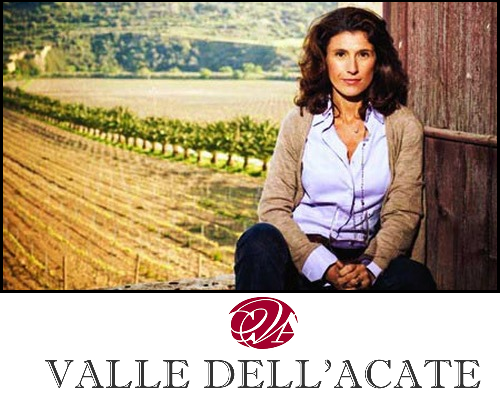 The winery “Valle dell’Acate” was born in 1981 from the initiative of two ancient families, living in the territory of Ragusa: Jacono Ricca and Ferreri dell’Anguilla, who have been cultivating their vineyards for ever and who lovingly care their wines to keep alive the memory of events and things passed down by previous generations. With the awareness of the historical value of their territory, they have pursued the objective of developing both the viticultural and oenological potentialities of the autochthonous species of grape wines. The new generations (and Gaetana Jacono in particular) have been entrusted with the task of promoting the knowledge of their products in Italy and all over the world. The grapes, coming from their own vineyards, are vinted in the winery located in the old estate of Bidini. Not far from there, the original wine vaults containing the old oak and chestnut barrels, which are used only for refining wines made out of particularly rare grapes are located in the courtyard of the Jaconos’ house. 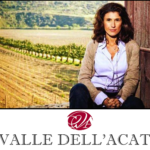 The winery “Valle dell’Acate”, operates in “contrada Bidini” in territory of Acate which, together with Vittoria and Comiso, bounds a triangular area where, for at least three centuries, people have been cultivating those grapes that make the most original and precious red wine in eastern Sicily: Cerasuolo di Vittoria d.o.c.. The vineyards of the winery stretch along the Dirillo Valley on the natural slopes that the homonymous river has been moulding throughout the centuries. The typology of the landscape, with its reeds along the river and thorny shrubs covering its steep slopes marks also the cultivated land, which is characterized in its lowest side by fine and more recent material, whereas in the area going up to the Acate plateau it changes into a particular substrate composed of limy sandstone interfaced with packets of clay. The old manor of Bidini and the vineyards that bear its name are located on the latter type of soil, called Milaro, which, with its different shades of yellow creates a suggestive atmosphere. Bidini, we think it would date back to the ancient Bidis, a Syracusan basis of the VI century in the Dirillo Valley (the Achates of the ancients) that then became a preferential road to link the northeast and the northwest of Sicily. The necropolis discovered in the southwest of the Feud of Bidini and the tombs placed above all in the south of Jacono houses confirm the Hellenism of the place. It is remarkable the note of “Pilino il Vecchio” that shows Bidini, Acrenses and Citarii as some Mediterranean people of the island. According to Cicerone in the “Verrine”, Bidis, which he locates “Haud longe a Syracusis”, reached some splendor around the middle of the I century, as it was ravaged by Verre.